Located in northwester Slovenia in the region of Upper Carniola, Bled is one of the most picturesque towns in Slovenia and a popular tourist destination. Only an hour away from Ljubljana, this scenic place is very fairytale-like in it’s dramatic castle standing atop a rock that overlooks a placid lake and snow-tipped mountains in its background. High-ranking officials and foreign dignitaries who are visiting Slovenia are ushered to Bled, where it is peaceful and not overly crowded like the large cities. During winter, Bled is deluged by skiers and skaters. And then, during the spring and summer months, tourists can enjoy the scenic view while riding row-boats called “pletna”, which is similar to Venice’s gondolas. Because of its milder climate, Bled was developed into a health resort and became a place where aristocrats go to in the 2nd half of the 19th century until the early decades of the 20th century. 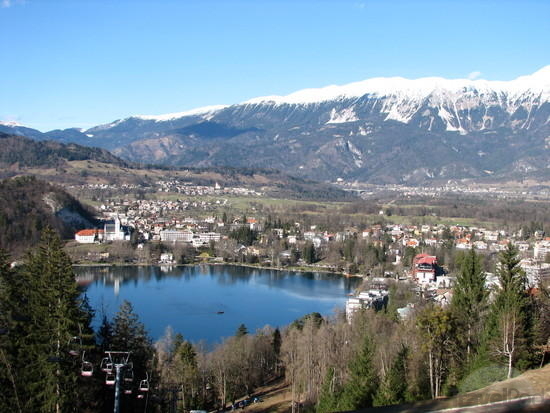 Today, Bled has become a venue for conventions and tourist destination offering various kinds of activities such as fishing, golf, horseback-riding, hiking, boating and other water sports. Bled is also known for kremna rezina (cream slice or what locals call kremšnita), a vanilla and custard cream cake dessert created by Ištvan Kovačevič, a pastry chef at the local Hotel Park in 1953.